This post was co-written by Rachel Deras, Librarian-in-Residence at Loyola Marymount University, and John Jackson. For the past three years, the William H. Hannon Library at Loyola Marymount University has hosted a Long Night Against Procrastination as part of its Spring Finals programming. Fifty undergraduate students are invited to attend a four-hour-long event and enjoy all the comforts and services the library can provide in a private, intimate space: a quiet room, access to research librarians and writing tutors, brain food and a never-ending flow of coffee and teas. With the exception of our Milk & Cookies event hosted during fall finals, our Long Night Against Procrastination (LNAP) is by far the most popular and most-requested library event of the academic year. 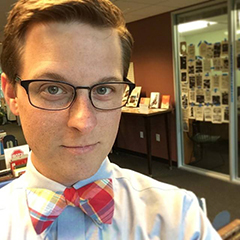 Based on similar events at other institutions, our LNAP was originally designed by Jamie Hazlitt, then our outreach and communications librarian. The current outreach team has followed the same model with few changes. The feedback is consistently positive and, though we've discussed the possibility, it is difficult to argue for making any changes to the model. We believe that our model is solidly designed and could be successful at almost any institution. Our LNAP begins at 8 p.m. the night before finals begin and runs until midnight. There is only one room in the library large enough and quiet enough (due to the ability to close it off from the rest of the library) to host the event: our third-floor event space. Students register at a front table and receive their free goody bag, which contains a mix of vendor-donated items: highlighters, pens, notepads and snacks. After a brief introduction — during which we talk about the schedule and the availability of tutors and librarians — the students get to work. We have scheduled breaks and raffles throughout the evening and order in pizza midway through. After midnight, students are encouraged to remain in the room and continue working, but the library staff and tutors call it a night. It is dangerous to go alone: you should never dismiss the power of your campus partners. Working with your campus writing center to have tutors on hand throughout the event might be an obvious choice. Other potential partners, like student housing (to help target on-campus students), business auxiliary services (to solicit donations from campus food vendors), or the bookstore (to solicit office supplies) may seem less obvious. We depend upon our partners to help get the word out about the event and to create the goody bags (we call them "survival kits") that we give to each attendee. Of particular note, this year we reached out to our database vendors and were delighted to find that many were willing to donate goody bag items and raffle prizes for the event. This year, we created digital graphics (for our homepage and social media) and a 8.5-by-11-inch flier. The flier was delivered digitally to a few key student stakeholders on campus (e.g. writing tutors, the first-gen program and the student workers in the departments of our campus partners), and the digital graphics were posted to our digital spaces. Within two weeks, the number of available spots were all reserved. In our post-assessment forms, we always ask attendees how they heard about the event. Almost half indicate they heard of it by word of mouth or had attended the event in the past. We are at a point where this event sells itself with little promotion being necessary. Due to space limitations, we can only host 50 to 60 students during our LNAP. As a result, we require RSVPs (which we collect via LibCal), but only in theory. We operate on an honor system when students show up, and we have never turned anyone away if they "brought a friend." Luckily, this system has worked for us thus far ... except for that one time we ran out of goody bags and one student was particularly grumpy about not receiving a free Bluetooth speaker. Understanding that college students are generally led by their stomachs, we knew we had to deliver when it came to the food we were supplying. Our snack tables included both healthy and non-healthy options (CLIF bars, assorted candy, cookies, nuts and pretzels), and enough coffee, tea and water to last through the night. At 10:30 p.m., we ordered 12 cheese pizzas that, when delivered, were devoured almost immediately. There were three scheduled study breaks during the night. The first was at 9:30 p.m. (an hour and a half into the night). During this break we showed a five-minute chair yoga YouTube video. We hoped that students would take a second to be kind to their bodies even when they are stressed out. Surprisingly, almost all of the students participated! The second study break of the night came at 10:45 p.m. when the pizza arrived. While students consumed the pizza, we showed a cute animal video to bring some smiles to our hardworking student's faces. The third and final break was at 11:50 p.m., when we passed out bubble wrap and had our students relieve some stress by popping the bubbles. This, by the way, went on for at least five minutes. This event does not require too many supplies. Students brought their own computers and notebooks, and we provided tables and outlets for them to plug in their laptops. We were fortunate enough to receive a variety of donations from our partners that we created "survival kits" from, which were lunch boxes stuffed with scantrons, blue books, pens, Post-it Notes, a whistle key chain, stress ball, cell phone holder, hand sanitizer, USB drive and snacks. While the two of us were the only members of the library staff that stayed the duration of the event, the night would not have all been possible without LMU's Academic Resource Center (ARC) writing tutors, our library events manager and our student assistant, who helped check in attendees. Three ARC student writing tutors were on hand to help edit and offer advice on student's papers. Our LNAP was held in the library's primary (and largest) event space. This allowed us enough room to hold 50 to 60 students as well as all of the food we provided. We wanted to make sure students had enough space to work comfortably and this room provides that for us. One of the main difficulties in expanding LNAP at our library is the limitations we have on space. While the library is adequately large, there are only a few spaces that offer a quiet space for a large group of attendees (i.e. there are doors we can close). The rest of the library is open atria, book stacks and individual study rooms; and sound carries fairly unobstructed throughout the library. If were were to expand LNAP in the future, we would need to essentially turn the entire library into one, giant LNAP event. We repeatedly remind the students that they will receive a feedback form via email after the event. Combined with the added incentive of a $50 Amazon gift card, our response rate on the survey is consistently around 50 percent each year. We ask students to rate on a Likert scale each of the events and amenities offered throughout the evening. We also ask students to identify their favorite part of the evening. Many students responded to this question with "free food!" but a surprising number of responses dealt with the co-studying aspect of the event: being with similarly motivated students helped them to stay on task and get things done. Most importantly, we ask student what they accomplished during LNAP: a paper, a study guide, a presentation slide deck, etc. We collect these responses into a brief report and send it to our partners and university administrators as evidence of the event's success. The model we have developed for our Long Night Against Procrastination is an ongoing success, now in its third year. Student feedback continues to ask that we expand the event to include more students. As noted aboved, we have reached maximum capacity within our own building. To expand the event would require a new venue or utilizing the public areas of the library. We are content to continue with our current model and possibly explore new ways of soliciting RSVPs (e.g. raffles, contests, golden tickets, etc.). Despite these limitations, we are thrilled that our event continues to be well-received and eagerly anticapted by our students! Time to Meet Your New Faculty! A late-night academic library program give students everything they need to plow through finals week.